COZUMEL PRIVATE MEAL SERVICE PROVIDED BY "CHEF ANTONIO"
“Chef Antonio” will provide sumptuous home-cooked meals in the privacy of your Cozumel Apartment. Awaken to a piping hot breakfast served inside or outdoors on your seaside terrace. Return from a hard day of playing or diving to relax and enjoy a leisurely lunch or dinner with your family or friends in the comfort of your Villa. Spoil yourself! The cook does the shopping, prepares the meal, serves you, and then washes all the dishes. 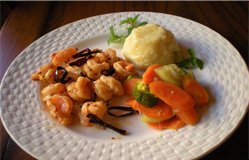 You just bring a hearty appetite and enjoy the fresh and delicious food prepared to your specifications. All ingredients in our dishes are fresh, fresh, fresh and meals are lovingly made from “scratch” (preparation time is 2 to 3 hours for most dinners). 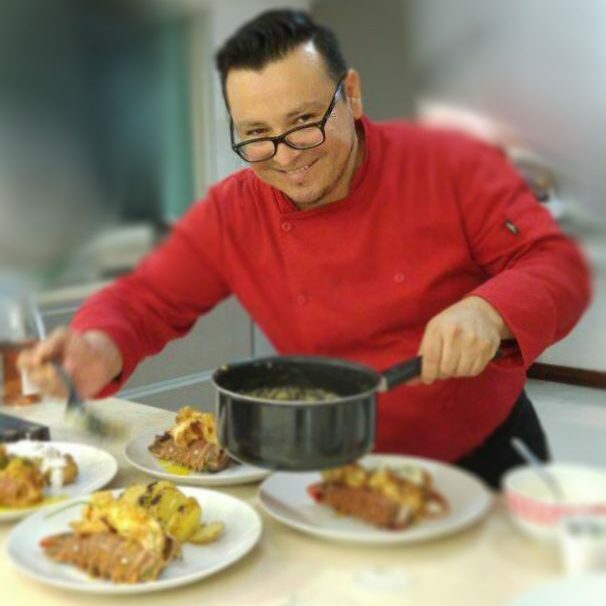 You are welcome to watch and learn how to make these dishes if you wish. When you go home, you can dazzle your friends with your new recipes! You choose when you want your meals. If you want to get going early in the morning, we’ll be at your home when you tell us (we’re used to doing early morning breakfasts for divers!). You decide whether you want to have dinner early or late. It’s your vacation and we’re here to fit into your schedule. Choose kid-tested favorites and your kids will be happy, too! Some kids don’t care for spicy or “different” foods, so we have other alternatives for them. $100 per child (age 2-9) per week; no charge for children under 2. That’s an excellent value when you consider that the average cost of a 3-course dinner in Cozumel is $25 to $30. 6 Days with 2 meals per day (breakfast and lunch OR dinner). Price includes the cost of the food, preparation and clean up. With weekly rentals, the food service generally starts with dinner on the day of arrival and finishes with breakfast on the day of departure. Sunday is the cook’s day off. Want the luxury of the customized in-home food service but still have the option of sampling some of the Cozumel’s great restaurants? 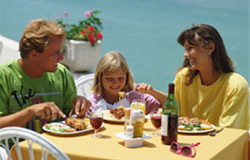 NO problem, you can arrange for cook service for as few as 3 days (and, they do NOT have to be consecutive days). Daily rate is $50 per person per day for two meals. We’ll work with you so you can have whatever your heart (and tummy) desires. We do ask that everyone in the group eat together at the same time and have the same choice of food items unless there are specific requests (allergies, vegetarian, etc.). Payment for food service is required prior to arrival. We recommend you make payment when you make final payment on your rental unit. 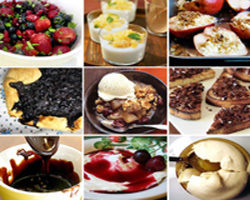 Served with Coffee, Juice, Assorted Fruit of the Season Bread, Butter and Jam. 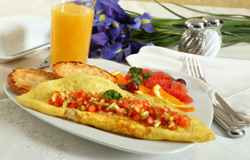 Egg omelette filled with ham and cheese (available with vegetables for vegetarians). Bread, coated and fried in butter, sprinkled with sugar and cinnamon, accompanied with bacon. Scrambled eggs with tomato, onion and green pepper. Fried eggs mounted on fried tortillas, bathed with red and green sauce, separated with beans. Tortilla chips covered in red or green sauce and bathed in chicken shreds, sour cream and cheese. Fried corn tortillas filled with Mexican style chicken and cheese, accompanied with red sauce and cream (Available without meat for vegetarians). 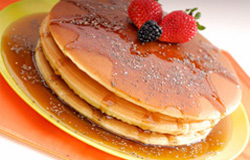 Have a delicious breakfast, lunch or dinner. 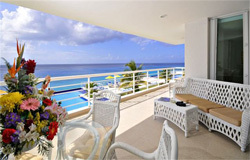 Enjoying the breathtaking views from your private ocean Front balcony in your condo! Start the day with a hearty breakfast. ! Remember, you’re at home, so you can eat in your pajamas. 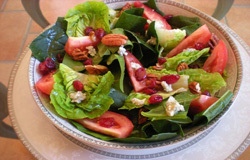 Served with Soup or Salad, Side Dishes and Dessert. From the sea to your table: Delicious Grouper fillet, oven baked with the flavor of achiote, xcatic chile and red onion wrapped inside a banana leaf, accompanied with vegetables and rice. No extra cost for shrimp. Authentic Mexican style! Delicious strips of chicken with onions, peppers and a touch of bacon, marinated in beer and spices, accompanied with beans, avocado mix and Mexican sauce. Chile Poblano stuffed with fruit, nuts, almonds, raisins and meat, bathed with an exquisite nut sauce (Also available without meat, especially for vegetarians). Delicious baked chicken with spices from the Yucatan region with the exclusive banana leaf flavor, accompanied with mashed potatoes and sautéed vegetables in butter. 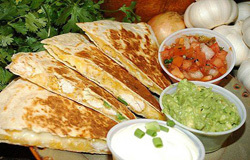 Chicken tacos bathed in green sauce, decorated with cream cheese and slices of onions, accompanied with rice and beans. – Hamburgers – Hotdogs – Yucatecan Spaghetti – Quesadillas – Chicken Fingers. Choose the snack option and we’ll serve tasty appetizers like nachos with cheese and sauce, quesadillas, crispy chicken tacos, guacamole and pico de gallo sauce . . . and more. There is an additional charge of $5 per person per day for snack option. Please remember that everyone needs to have the same food choices(unless there are special dietary requirements due to allergies, etc.). Savor the flavors of authentic Mexican and Yucatecan cuisine prepared with the freshest ingredients. or salad. Choose from a variety of tasty salads,including mixed salad,spinach salad,red cabbage and pear salad and avocado stuffed with tuna salad. Tacos filled with vegetables smothered with au gratin sauce and accompanied with beans and rice. Combination of mushrooms, garlic and chile guajillo in rings with onions and carrots covered over a bed of rice. Twigs with egg and Parmesan cheese in a red broth. Fried potatoes mixed with egg and Parmesan cheese served with a Yucatán sauce and fresh salad. Delicious flavor from Jordan: Eggplant slices with onion, tomato, garlic and cilantro plus flavor of cumin, accompanied by rice. stuffed with mushrooms and topped with cilantro sauce, accompanied by vegetables. 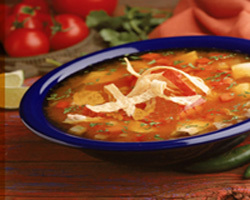 Soup choices include minestrone, aztec soup, lime soup, poblano soup,leek and potato soup or broad bean soup.